The 2019 Chevrolet Sonic is an inexpensive compact car big on fun, features and smart good looks. The 2018 Chevrolet Sonic offers small car size, pricing and fuel economy in a fun-to-drive subcompact with lots of cool features. 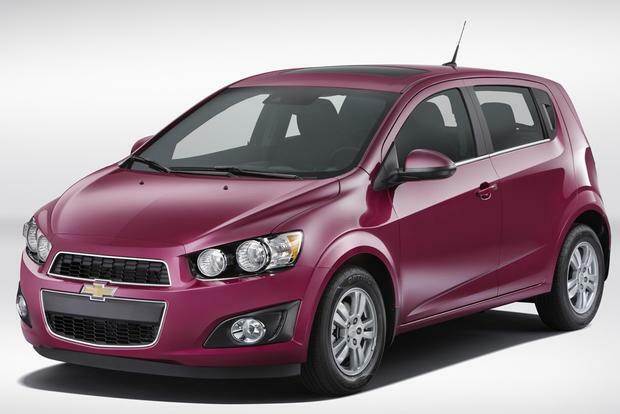 2015 Chevrolet Sonic vs. 2015 Chevrolet Cruze: What's the Difference? 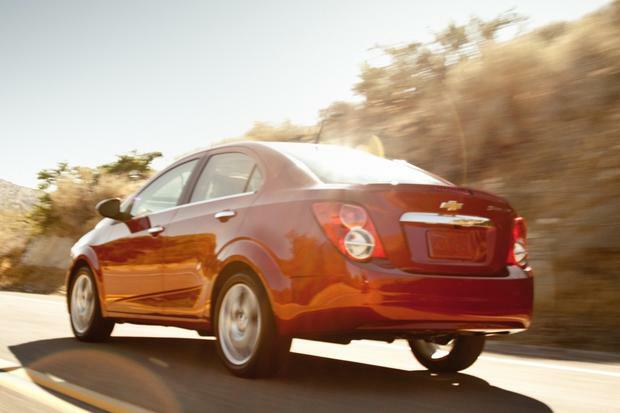 We're comparing two small Chevrolet models -- the Sonic and the Cruze -- to help you understand which one is best for you. If you're shopping for a hatchback on a shoestring budget, there are some great deals to be had among the many CPO offerings out there. Few new cars have undergone a transformation as dramatic as Chevrolet's subcompact has. Indeed, the difference between the outgoing Aveo and the 2015 Chevrolet Sonic is staggering. Where the Aveo was slow and dull-witted in corners, the Sonic is quick and surprisingly agile. Where the Aveo had the look of a 1990s bargain-bin leftover, the Sonic is sharp, modern and full of well-designed and thoughtful features. It may have its foibles, but they are few and far between. If you're in the market for an affordable pint-sized champ that won't make you feel second-class for driving it, the Chevrolet Sonic may be just what you're looking for. The Sonic comes with two updates for 2015. 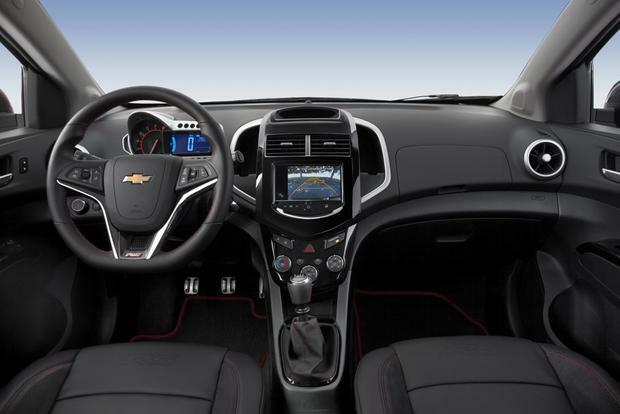 In addition to offering the latest OnStar system with 4G Wi-Fi capability, the 2015 Sonic also adds its 1.4-liter turbocharged engine as standard equipment in LTZ models. Standard on LS and LT models is a 138-horsepower 1.8-liter engine with a 5-speed manual transmission. It returns a decent Environmental Protection Agency (EPA) rating of 26 miles per gallon in the city and 35 mpg on the highway. Adding the optional 6-speed automatic transmission makes for more convenient in-traffic driving and reduces the estimated city mileage by an almost imperceptible 1 mpg. 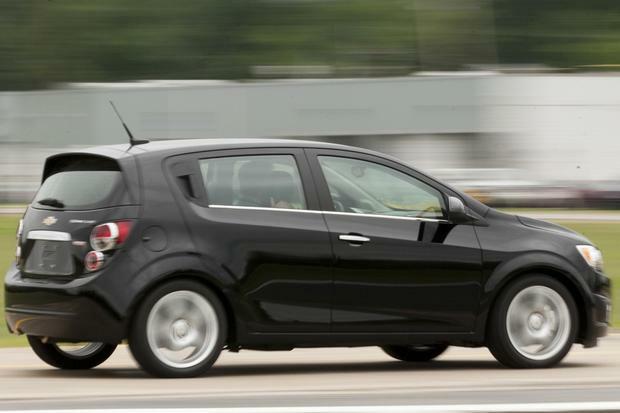 Although the 1.8-liter standard engine is a solid performer in this size category, the Sonic's dark horse is the optional 138-hp 1.4-liter turbocharged engine that it borrows from the Cruze Eco. Available with a manual or automatic transmission, the 1.4-liter Ecotec engine, standard on the Sonic LTZ, makes for some seriously fun driving. It returns 25 mpg city/33 mpg hwy with an automatic or 27 mpg city/34 mpg hwy with a manual. 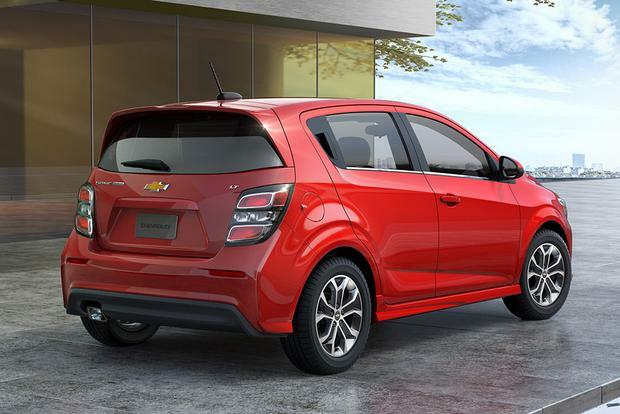 The Chevrolet Sonic comes in four trim levels: base-level LS, midlevel LT, upscale LTZ or sporty Sonic RS. The base LS model ($15,100 for the sedan or $15,800 for the hatchback) comes with premium 15-inch alloy wheels as standard equipment, along with air conditioning, remote keyless entry and a tilt-telescoping steering wheel -- all items that make the car stand out among its competition and feel like a higher-class entry than it is. Next up is the midgrade LT (starting at $16,600 for the sedan and $17,200 for the hatch). It adds a 6-speaker sound system with SiriusXM Radio, power windows with 1-touch up and down motions and heated exterior mirrors. 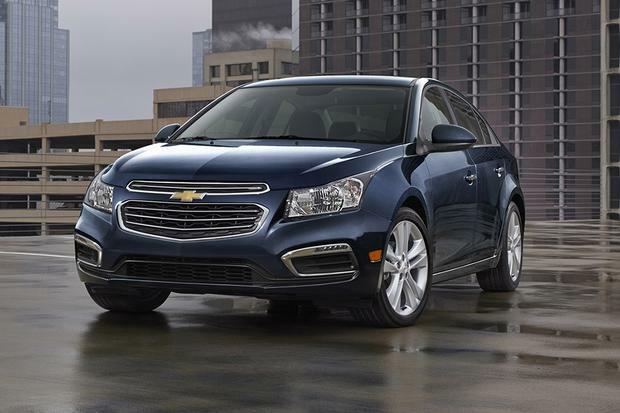 The upper-end LTZ ($19,100 for the sedan or $19,700 for the hatch) adds the turbocharged 4-cylinder engine. It also boasts a much higher level of smartphone integration, including a USB port and Bluetooth connectivity, along with steering-wheel-mounted audio controls, heated front seats, cruise control, fog lamps and larger 17-in alloy wheels. The sporty RS starts around $20,800 as a sedan or $21,400 if you choose a hatchback. In addition to performance-oriented items such as an upgraded suspension and a sport-themed steering wheel, the Sonic RS boasts leather upholstery and 4-wheel disc brakes. The Sonic boasts a slew of standard safety features, including a class-leading 10 airbags, electronic stability control, anti-lock brakes and crash-collapsible pedals to protect the driver's feet and legs. New safety options include a forward collision alert system, a lane departure warning system and a rearview camera. The Sonic has received a 5-star overall crash-test rating from the federal government's National Highway Traffic Safety Administration. To earn that rating, it scored five stars in frontal- and side-impact tests and four stars in rollover tests. On flat-to-slightly sloping uphill runs, the 1.4-liter turbo was incredibly zippy. While we didn't measure it ourselves, Chevy claims the engine can get the car to 60 mph in about 8 seconds -- a claim that our experience certainly supported. The turbo tended to lose power on moderate-to-steep uphill climbs, requiring what we felt was an excessive amount of downshifting on the 6-speed manual to power through. Even with rather sporty driving at average speeds of about 40 mph in both the city and on hilly canyon roads, we were able to squeeze 32 mpg out of the 1.4-liter turbo with the manual transmission. The nontraditional gauge cluster places a conventional tachometer to the left of a bright blue digital display that collects everything from current speed and direction to average fuel economy and distance driven into one easy-to-read package. While it took a bit of getting used to, after driving with it all afternoon, we wouldn't be surprised to see other manufacturers start copying this gauge implementation. When combined, the Sonic's supportive seats, excellent suspension, standard driver armrest -- a rarity in the subcompact market -- and tilt-telescopic steering wheel made for one of the most comfortable rides of any small vehicle we've driven. 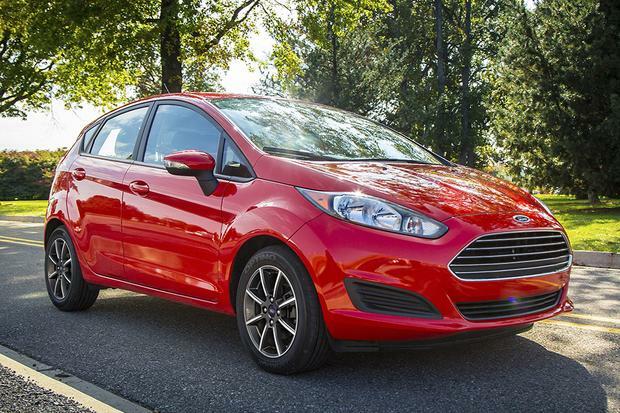 Ford Fiesta -- Ford's smallest model comes in a sedan or hatchback body style. It also offers a great driving experience and frugal engines. Hyundai Accent -- The newly redesigned Hyundai Accent also comes as a sedan or a hatchback. Equipment is generous, but fuel economy can't match the Sonic. Nissan Versa -- Nissan's latest Versa can't match the Sonic in terms of driving enjoyment. Pricing, however, is a strong suit; the Versa remains one of the least-expensive cars on the market. 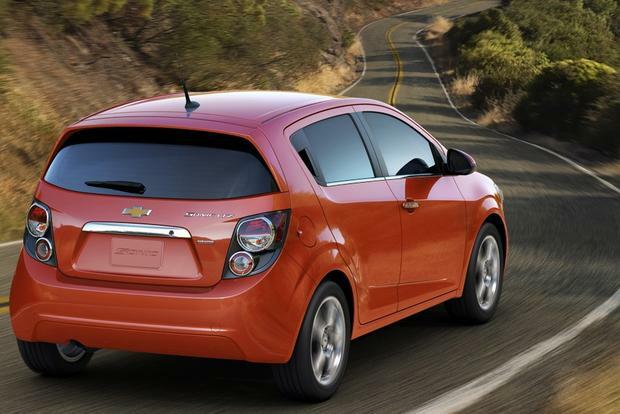 We think the 2015 Chevrolet Sonic is one of the best subcompact cars you can buy. If we were on a budget, we'd choose the LS; it offers basically everything you need in an affordable small car. If we had a little more money to spend, we'd go with the LTZ. It offers just about everything we could want. 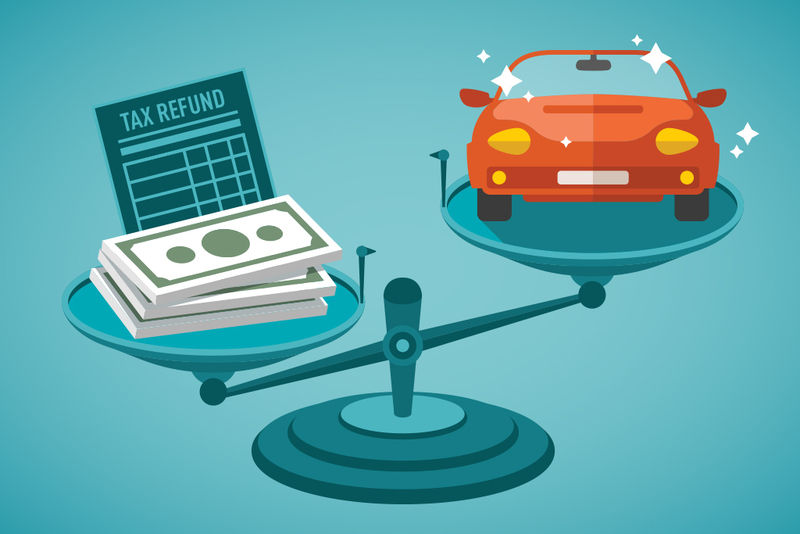 In both cases, we'd go with the hatchback for its improved practicality -- even if it means spending a little extra cash.